When I last spoke to Graham Bredemeyer over a year ago, he told me that he was developing a unique 3D printer platform in his own apartment in Chattanooga, Tennessee. Since that time, the technology has evolved into a startup called Collider, complete with an R&D lab and an advanced 3D printer dubbed the Orchid. 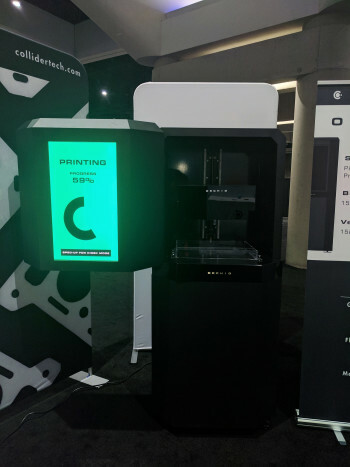 Unveiled at Inside 3D Printing San Diego, the Orchid may hold as much or more promise for 3D printing as Carbon’s M1 3D printer and continuous digital light processing (DLP). The system is capable of combining the dual strengths of reaction injection molding and continuous DLP 3D printing to produce geometrically complex parts from a potentially vast array of materials available to the reaction injection molding industry. In conjunction with the big unveiling, I spoke with Bredemeyer, who is both CEO and founder of Collider, to learn exactly how the technology works and what Collider plans for the future. The Orchid implements a hybrid 3D printing technique that Collider refers to as “Programmable Tooling.” The process begins with continuous DLP 3D printing, the projection of near-UV light at a vat of resin to produce layerless parts at very fast speeds. 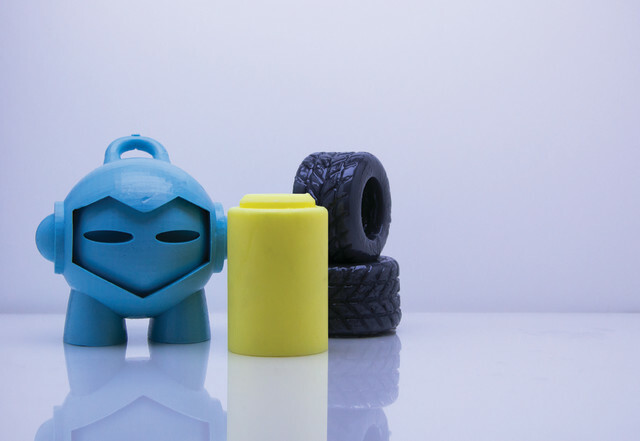 Similar technology can be seen at companies like Carbon and 3D Systems; however, Collider has introduced a second step in the process that changes the 3D printing ballgame altogether. 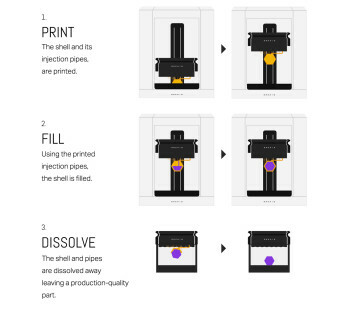 Unlike other continuous DLP platforms that 3D print solid objects, the Orchid 3D prints molds with extremely thin-walled shells. Once the mold is complete, the print bed is raised and, through a hole in the bed, reaction injection molding plastic from a two-component resin meter mixing system flows into the hollow shell, filling it with thermoset resin which hardens into a solid object. At the same time, through a second hole, an air control system ensures that there are no air pockets or deformations during the reaction injection molding process. All of this takes place within the machine itself, meaning that there is no manual intervention along the way. It is only after this second step that the object is manually removed and rinsed with hot water to remove the outer shell. The result is a fully dense plastic part. The advantages of Programming Tooling could be a thousand-fold, in that by introducing traditional reaction injection molding plastic to the 3D printing process, the Orchid can potentially use many of the thousands of variations of existing 2K thermoset materials already on the market. Bredemeyer argued that this tackles an issue that manufacturers face in relation to the high cost of tooling for small batch parts. Therefore, rather than attempt to develop materials in-house, Collider invented Programmable Tooling as a means of getting at the root of the problem by making a system that can perform batch production using the wide range of existing materials. A manufacturer could potentially save a tremendous amount of time and money with a rapid production technique such as Programmable Tooling. Collider estimates that the time and tooling required to make a run of 10 tail lights would take 11 days and cost $259.40 per unit, due to economies of scale related to tooling. Using the Orchid, the firm estimated that it would only cost about $5.44 per unit and take two hours. The use of existing reaction injection molding resins makes it possible to bypass the standard material development steps associated with 3D printing, and instead test and validate existing reaction injection molding plastics. To start, Collider has partnered with Pennsylvania-based material maker Smooth-On, which has been making rubbers and plastics since 1895. Bredemeyer explained that the choice of Smooth-On as a materials partner was an obvious one, given the fact that Collider had already been using the firm’s thermosets in the lab throughout the development process. With an established material supplier in tow, Collider is coming to market with six different production materials: general-purpose rigid polyurethane (PU), firm PU rubber, flame retardant PU and medium softness silicone. This opens up possibilities for producing everything from mechanical parts to gaskets, interior aerospace parts and insoles. In the near future, Collider may put out its “material API” and invite manufacturers to send samples for quality and compatibility testing. Once approved, Collider can become a reseller of those chemistries for use with the Orchid. According to Bredemeyer, it can take as long as a week or as little as 48 hours to validate a material. While they are beginning with just a handful, Bredemeyer said that the lab has already demonstrated the ability to print with about 15 resins. At the same time, the Programmable Tooling process maintains the benefits of continuous DLP technology: the ability to manufacture geometrically complex, custom parts on-demand and quickly. Because the printed shells can have intricate designs, the only design limitations are those associated with the DLP process. The detail resolution is comparable with other continuous DLP systems, and Bredemeyer said that speed is not an issue. With a build volume of 15 in x 8.5 in x 15 in, the Orchid can currently print at a rate of about 7 cm an hour. The goal, however, is an ultra-fast speed of 36 cm per hour. Bredemeyer said that, in the lab, they’ve demonstrated the ability to 3D print at three times that speed, but are currently working to ensure that quality is consistent. The commercialization process for the Orchid is an interesting one. While the technology is already capable of producing end parts, Bredemeyer believes that they can still fine tune a few things before planting Orchids out in the wild. For this reason, Collider is beginning with a service bureau model, which will make it possible for customers to begin manufacturing parts with the Programmable Tooling process before committing to acquire a machine. Interested parties can reserve a “virtual” Orchid located at Collider’s facility in Chattanooga, similar to how one might use Amazon’s web services. Then, in 2018, the startup will bring the Orchid system itself to market, where customers can get their hands on the Orchid. Bredemeyer has been in the 3D printing industry for seven years, including working as a contributor to the Wohlers Report and managing strategic accounts at Shapeways. He eventually set up the country’s first 3D printing accelerator in Chattanooga, part of the larger GIGTANK incubator program where startups like Feetz and Branch Technology were established. As Chattanooga continues on its path to become the Silicon Valley of the Southeast, Bredemeyer founded Collider there, bringing four other experienced team members with him. His firm has since obtained a total of $465,000 from Asimov Ventures and the Chattanooga Renaissance Fund, and is looking for $2 million more for 15 months of further technology development and pilot sales. If Collider can deliver on its promise, it may rival existing continuous DLP technologies. Given the fact that Carbon has received $222 million in its brief history, there’s no reason to think that the same is not possible for Collider, as well.